The Human Body is a miraculous thing. A wonder of engineering, design, and capacity, there is no invention of man that even resembles the Human Body in its absolute genius or function. It was perhaps a pity then, that the Scouts and Guides attending WWG South III were instead playing the part of the various vile and disgusting invaders attempt to infect an unfortunate host. Pitted against the best efforts of modern medicine and the body’s supply of antibodies, the invading Patrols were given the mission of claiming as much of the body as possible. The entire WWG playing area became the unfortunate body playing host to a catalogue of mundane and exotic diseases – with bases representing the various organs: Heart, Brain, Appendix, Lungs, Kidneys and the Lymphatic System. Venturers, Rovers and Leaders played the parts of Antibodies and Medicine, both working to neutralise the invaders. Patrols were classified into three types of disease: Bacteria (weakest and most numerous), Viruses (group hunters), and Pathogens (top-rank deadly diseases). Each disease type was then responsible for “infecting” as many bases as possible, holding off the body’s defenders, and hunting (or evading) other diseases. The Patrols were kept busy with activities such as “sneezing” with bottle-bazookas, trying to rupture the Appendix with NERFÂ® guns, attempting to drain “Blood” from the Heart, and working to scramble the host’s neural pathways. All in all, it was mildly disgusting (yet educational) weekend. In a new twist for WWG, Venturers were given a scoring game role as antibodies, using pocket barcode scanners to record diseases they encountered and defeated. Competing amongst themselves to earn the title of “most cruel”, they were also able to wrest control of the various bases from the diseases. The “Cured” Wooden Spoon award went to Bodalla/Tuross “Lost and Dead”, the only troop to accumulate a negative point total. 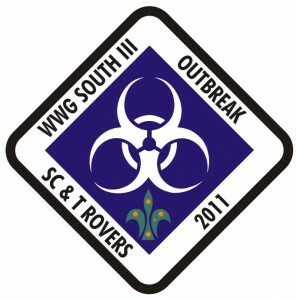 Once again, the Rovers of the South Coast and Tablelands wish to extend their thanks to the Venturers and Leaders who contributed their time and effort to the success of WWG South III.